Whenever you get ready for a move, both big and small, it’s important to plan ahead and get a quality long distance moving company Long Island NY residents trust to support your efforts. Long distance moving companies often offer a range of services including residential moving, long distance moving, cleaning, junk removal, storage, and much more. The best moving companies typically have lots of customer feedback, a dedicated staff, and a history of success — if you’re looking for one of the most professional long distance moving companies Long Island NY provides then you’ve come to the right place. 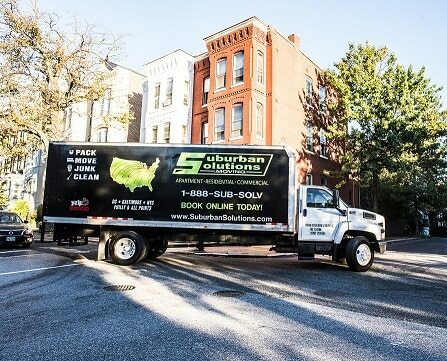 We’re Suburban Solutions, one of the premier long distance moving companies Long Island NY clients depend on with a long standing history of success. We first started out in 2010 in Washington D.C. and moved into Brooklyn NY in 2012. Since then, we have expanded our operations to become a trusted full-service solution for all your moving needs. Packing – It is essential to make sure all of your belongings are safely and securely packaged before a long distance move. We will lend a hand in packaging anything from bed frames to small kitchen plates. We are committed to ensuring a successful move. Other Moving Options – If you’re not doing a long distance move any time soon, then perhaps one of our other services would be more beneficial. Local Moving – Whether you’re moving across the street or to a new neighborhood, we’ve got you covered. Sub-Solve Express – Quick and easy city to city moving. Commercial Moving – Your business is our business. We work outside of your working hours and ensure the proper care of all your equipment. Junk Removal – We pride ourselves on always giving customers a fair deal. Our uniformed junk removal team will come to your house, apartment, or office and help you downsize on your clutter. Just pay for what we take – everything gets donated to our local Goodwill. Cleaning – We have numerous cleaning options for any situation you might find yourself in. Schedule Home Cleaning – End to end weekly and biweekly housekeeping services. Turn-Over Clean – Restoring your residence to ‘broom level’ clean. Sub-Solv Service – Made specifically for furnished residences. Office Cleaning Service – A clean office is essential for employee motivation and a great first impression. One-Time Cleaning Service – A highly effective one-time clean for any event you might have. Regardless of your needs, Suburban Solutions is here to tell make your life easier. To get a quick and free quote from one of the best long distance moving companies Long Island NY residents depend on, call our office at (917) 697- 4555.